Hristo Gaberov was born in Kardzhali, Bulgaria in 1973. 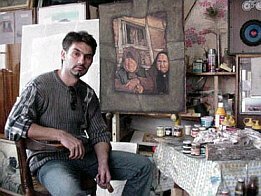 He graduated fine arts painting in St. Cyril and St. Metodius University of Veliko Tarnovo. He has been a member of the Union of Bulgarian artists since 2000. Hristo Gaberov takes part in many group and one-man exhibitions troughout Bulgaria. Some of his art works are property of private collectors from Portugal, USA, The Netherlands, South Africa, etc. In Sep, 2nd 1999 Hristo Gaberov and the traveler Volodia Sorokin started a bike trip from Bulgaria to South Africa trough the Middle East – Turkey, Syria, Jordan, Israel, Palestine, Egypt – 5500km for two months and a half. They flew between Cairo and Nairobi, Kenya. After that, again on the bikes, they rode trough Kenya, Tanzania, Malawi, Mozambique, and Zimbabwe down to South Africa – 7000km. The travelers got back to Europe in the spring of 2000. They flew from Johannesburg to Lisbon Portugal, then again with the bikes they rode trough Portugal, Spain, Andorra, France, Switzerland, Germany, Austria, Italy, Slovenia, Croatia, Serbia and finally Bulgaria -4500 km total in Europe. There were no sponsors. Hristo and Sorokin had $ 1000 each. The whole trip lasted 300 days, the travelers passed trough 23 countries on three continents, and rode the bikes for 16500 km. Hristo and Volodia got back in Sofia, Bulgaria in June,16th 2000. After all this, Hristo painted 22 new pictures with African motives.